Since I want to do all my groceries at once, it’s more convenient for me to buy Nate’s stuff along with all the groceries. I do my groceries every other week, after payout, of course, haha. And even though I like the Personal Collection Shampoo and Bath Soap for Nate, I can’t find them in groceries and I can’t seem to find any seller nearby, so I had to look for another brand that I is available in the supermarket. Not that I’m giving up quality over convenience, it’s more of looking for another product which has the same quality, but with a cheaper price and is more accessible. Hence, the Babyflo Baby Shampoo. What I like about this product most of all is its smell. It smells really good and it’s perfect for Nate. You know how toddlers can get super active and hyper sometimes that they get too sweaty, right? So before you know it, the scent of the soap and cologne is gone after an hour or 2. With Babyflo Baby Shampoo, Nate’s head still smells good even after a few hours of activity. So, the smell of the product is really important for me. And this the main reason why I stick to this product. This product doesn’t cost more too. With a price around 54 pesos and some change, you get 125 ml already. That usually lasts for about 3 weeks for Nate with daily bath. Not bad at all, super cheap. With its “no-tears formula, you don’t have to worry about the bubbles going in your child’s eyes. I always look for this formula when buying Nate’s soap/shampoo since he’s still young to know how to avoid getting the formula into his eyes. Babyflo Baby Shampoo is available in almost every groceries. I buy it either in SM San Mateo sipermarket or in Mercury Drug near our place. And that’s what I like about it too, for it being readily available when I need it. Convenience is very important to me, I can’t waste time just looking for the product that I need. I want it to be available whenever I need it, and that’s what I like about Babyflo Baby Shampoo the most. 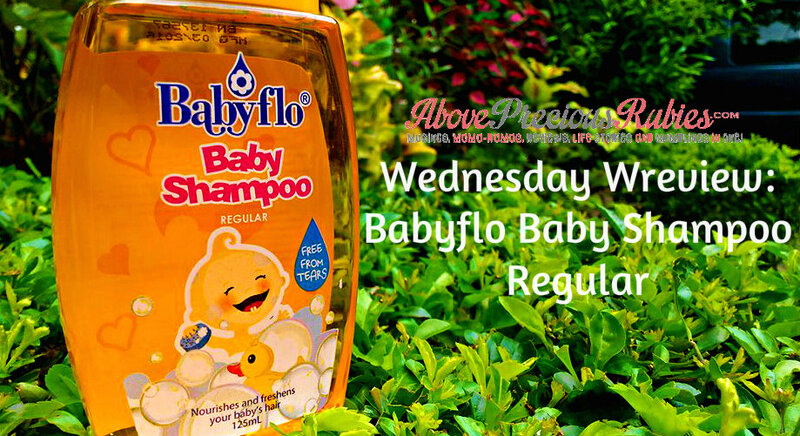 Babyflo Baby Shampoo is available in Mercury Drug, SM supermarkets and all leading supermarkets near you. What shampoo do you use for your child? I’d like to hear from you. I haven't tried this brand, my son used Eskulin shampoo when he was in toddler years. Tumatagal yung amoy kahit pawis. My son uses nivea baby but I have seen this in groceries. I'll give it a try next time. Havent tried this as well but seems a good choice given the scent, price, and availability. My baby uses Cetaphil. We have a few bottles of Tiny Buds, Belo Baby and Pigeon as well thus we use them, too. Sayang naman. But i think he is more hiyang sa Cetaphil and Tiny Buds. We are yet to use Belo Baby. I don't stick to just one brand; I usually rotate para iba-ibang scent yung ulo ni Yuri haha. My one standard? It shouldn't contain parabens! I've seen this last time when I was looking for a shampoo for the kids. I ended up with Eskukin though because of the Mickey Mouse character on the bottle. Haha. Never tried that brand either sis, I might check that out too! hehe. Oh, yours are bigatin sis! hehe. I got my Belo Baby products na, unfortunately, walang shampoo. hehe. You have a good standard Maan. I guess I should start thinking of that too. I was almost tempted of the Mickey Mouse packaging as well! haha. We are currently using j&j for my little Twinkle but I want to give Babyflo a try as well. Great review. I haven't tried Babyflo to my kids when their little. Good thing that there's a lot of options now for our kids ano? I used Lactacyd blue when my kids were small and cetaphil too. When they were growing up, I used J & J no more tears formula. But, I kept changing brand whichever catches my interest in the grocery store. I haven't tried this though..
Lactacyd and Cetaphil are great brands. Subok na din sila.